It’s been a long time since I’ve ripped out knitting. I seem to have ironed out the kinks in my design process to the point where ripping back has become pretty uncommon. Or maybe it just means that I’m not doing enough new things. Either way, yesterday I was thinking about how long it’s been since I’ve ripped back…while ripping back the striped shawl sweater. ….which is about 2/3 of the stitches, and brought me back to exactly where I was the last time I showed you photos. Fortunately, I haven’t been breaking the yarn between color stripes, so all my yarn is still intact. 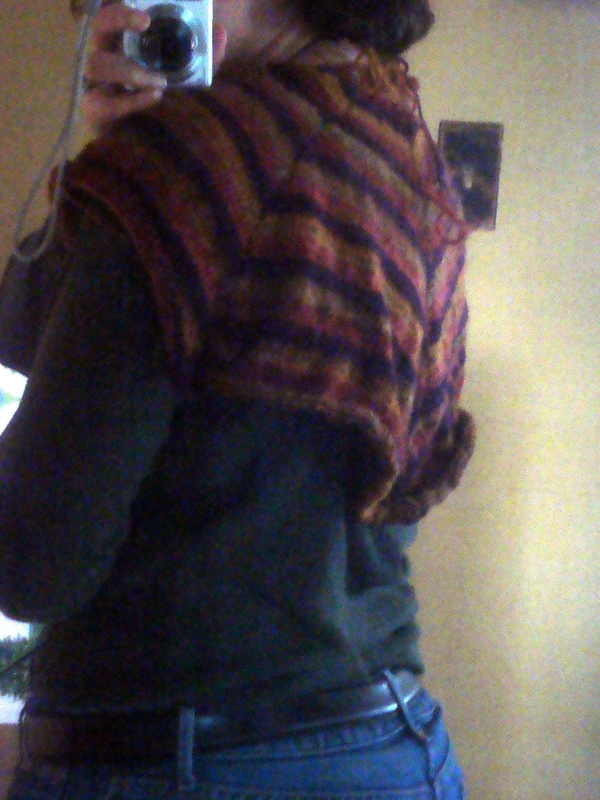 I’ve been having my doubts about this turning into a sweater, and wanted some insurance in case I needed to frog. After putting all those stitches back on the needles, I thought about switching back to knitting a simple shawl instead, but I’m too far into the sweater design now, so I’m forging ahead anyway. The construction is too interesting to ignore. If it doesn’t work out, I can always pull back again and turn it into a shawl. The other detail that’s nagging at my mind is the fact that I was already halfway through my yarn in that first photo above. That’s not terrible mileage, and I’ll actually get a lot back from the stitches that I’m eliminating in this second round, but I’m still not sure I’m going to make it to the end. 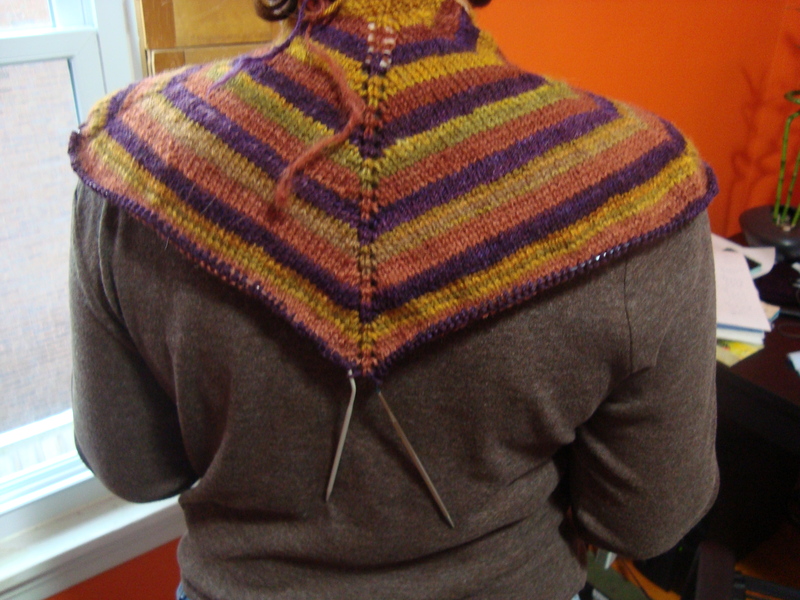 I’m also not sure that I want a sweater with that many strong stripes, and I have my reservations about a large arrow pointed directly at my behind if I continue the shawl point all the way down to the hem of a full sweater. (Some features don’t really need emphasizing with big flashy arrows.) In answer to that second concern, Jocelyn suggested using a matching color to fill in the extra yardage and cut down on the arrow-ness of the point. I’m finding myself quite taken with that idea, and have been trying to work out exactly how to add another color into the design. There’s also the (not insignificant) question of whether or not I can get a good color to match. I should be able to get something close, because I dyed all the yarns in the project. In theory, that means that I should be able to recreate them. (Strong emphasis on in theory there.) I have it stuck in my head that I want more of that purple, and it’s been 3 years since I dyed that color. My dye technique isn’t terribly repeatable even on the same day, never mind with three years and different jars of dye to add to the challenge. Still, I wanted to see how close I could get. I have my dyeing notes, and there’s nothing I love better than a challenge, so yesterday I mixed up some new solutions and painted them on the last of my Falkland. And I have to say I’m pretty pleased with how it came out. I made 3, 4-oz pieces, plus about 2 oz that I had left over at the end of the bag. If you look closely, you can see a ball of the original yarn sitting in the middle there. I have a feeling that this batch will spin up lighter than the first, but other than that they are pretty close. 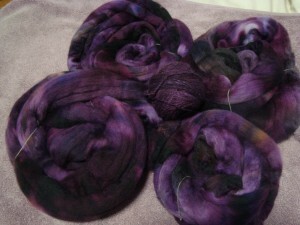 So, I think I’ve added yet another fiber to my spinning queue. The list is really getting quite long now, but I think that’s a post for another day. For now, I’m off to make up lost time. I find I don’t mind ripping, whatever the reason, if I put a few days between discovering the problem and the actual ripping. An advantage of being a “process” knitter I suppose–even tinking back one row upsets my mom who’s definitely a “product” knitter. Hopefully you’ve worked out all the problems now, though, so it’s the last of the ripping! The Falkland cam out at a really good match, although I can see that it might turn lighter in the finished yarn. Enjoy the spinning/knitting! You are definitely brave. Hope the additional fiber spins very close to the old purple. I agree with the not minding ripping. I think I am more of a process knitter and love the challenge of figuring out what to do, so the ripping I don’t mind. Ooh, very cool! I am loving those purples, and now I can’t wait to see how you incorporate that into the sweater (maybe short rows, to disappear the point, she wonders?). And I also am looking forward to hearing what you think of spinning the Falkland. In theory, theory and practice match. In practice, they rarely do. Apparently you have hit quite close at the least to one of those rare times. Well done! And good call on the rip – had you kept going, it would have lost the aerodynamic feel. Didn’t even notice the ball of yarn in the middle till you mentioned something. Even if it spins up lighter, it is still in the same color family and will look great with your sweater! DesigKnit is powered by	WordPress 4.8.9 . Page generated in 0.459 seconds using 36 queries.